Creating memories with our children is such an important part of being a parent. This is why I love creating crafts with my girls that they can give to loved ones. Especially grandparents and parents. It’s perfect for hanging in your home or office. Displaying your child’s love for all to see. 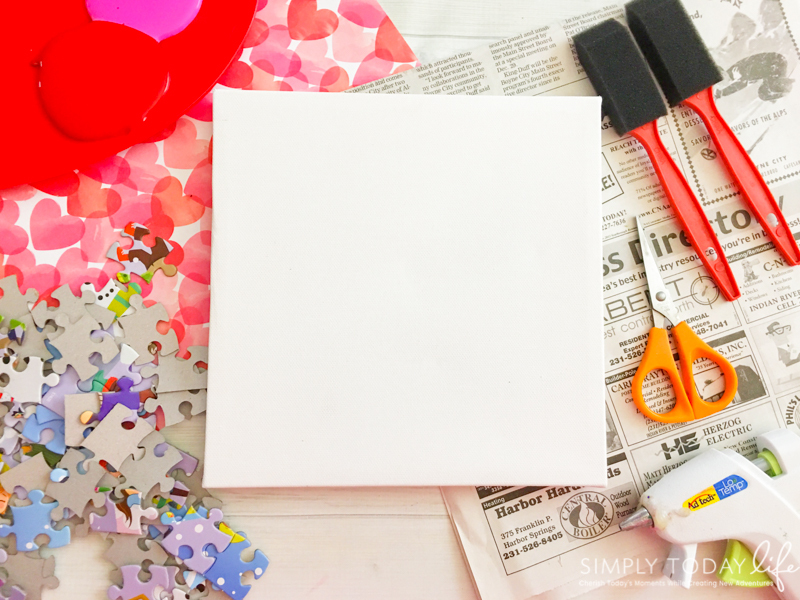 If you’re looking for an easy Valentine’s Day craft to do with your kids, then you will love this. Not only is this craft easy, but it’s actually very fun to make. It’s a special craft that at the end you don’t have to throw away, instead, you can proudly display it all year long. 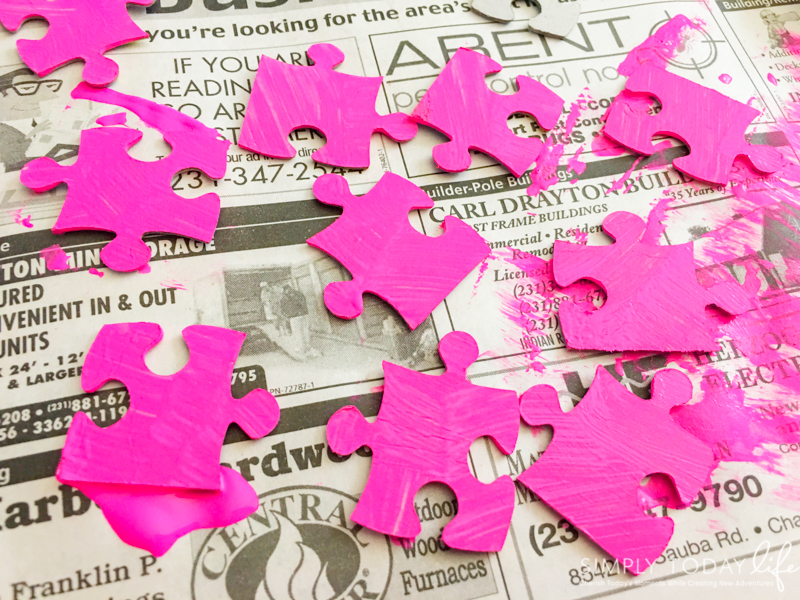 Lay an old newspaper out and paint the back side of each puzzle piece either pink or red (about 25 of each color) and let dry. 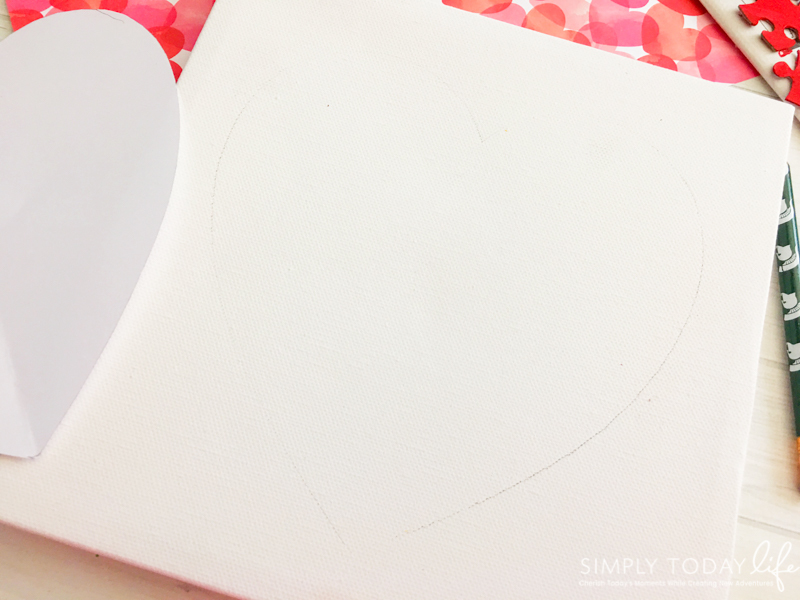 Fold a piece of 8×8″ paper widthwise and cut the heart out on the folded line. Trace your heart lightly onto the center of your canvas. This will help with lining up the puzzles when gluing them down. Start carefully gluing your puzzle pieces onto the heart, do not go outside your pencil line (it helps if you place the flat edges against the sides of the heart as I show in the photo above). For now, don’t worry about the glue strings you leave behind. You will be cleaning these off later on once you are finished with your heart puzzle canvas. 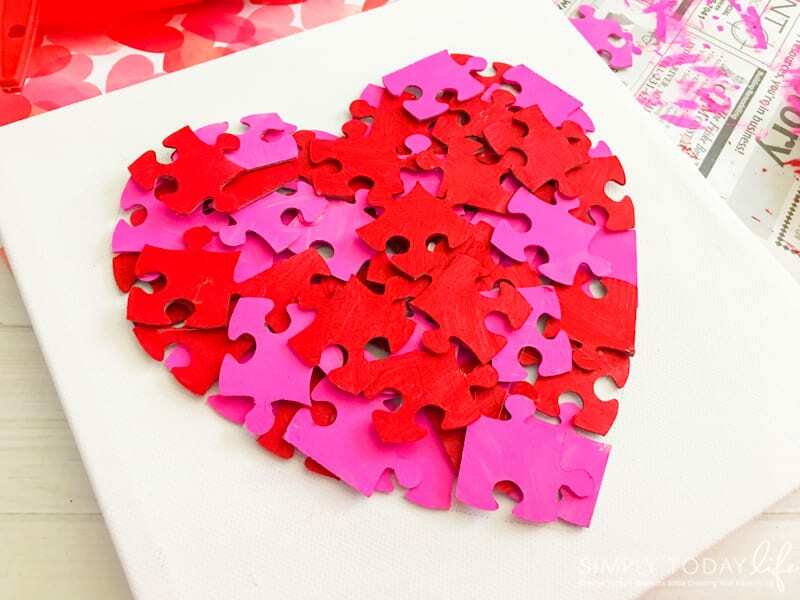 Once your heart is full, glue a second and third layer of puzzle pieces covering up the empty spaces. Clean off any hot glue strings with a clean paint brush or a clean toothbrush. Display your work of art or gift it to grandparents. They love showing off their grandkids work. I told you this was going to be an easy, yet fun craft to do with the kids. I don’t know about you, but I’m all about minimizing and spending less money as the years go on. Buying Valentine’s Day cards just seem such a waste and they end up in the trash later on. That’s why I love creating these fun easy crafts with my girls to gift to those who I know will cherish them always. 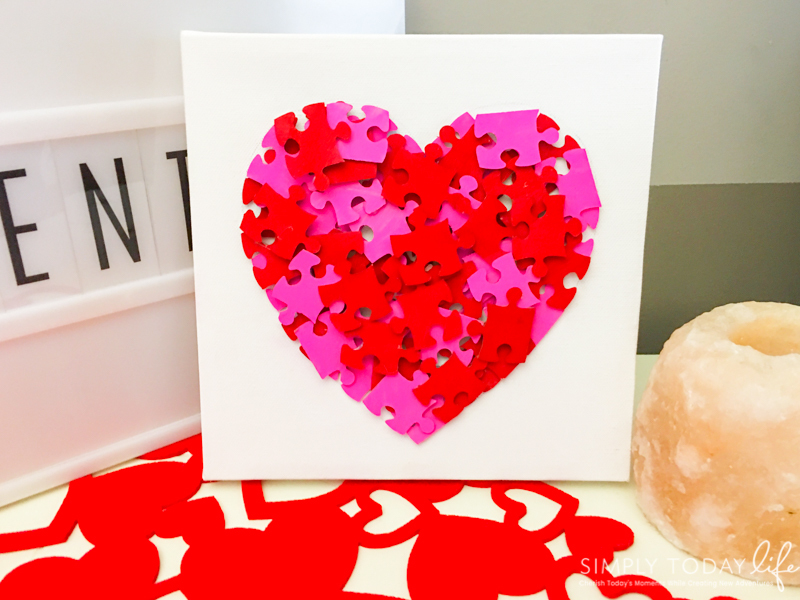 Who will your kids be gifting their Puzzle Heart Canvas to? 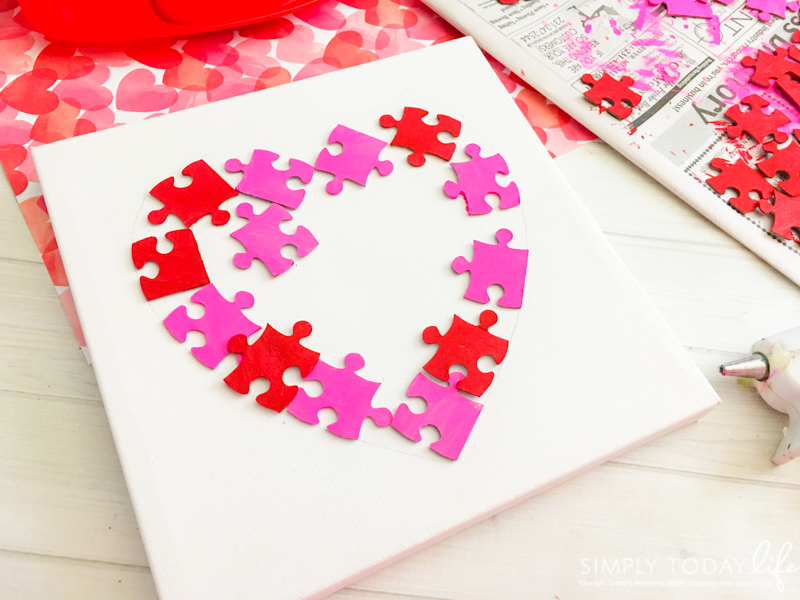 I love Valentine’s Day and would love to make this with my niece! We do too and it’s such a fun easy craft!